Sergio is an Italian skipper and a solo sailor. After leaving a good career in IT to pursue his ocean’s dream, he was trained for two years at the training center for solo-sailors navigator in “La Grande Motte” (France). In 2011, Sergio took part in the “Minitransat” the hardest ocean race in the world. Boarded on a boat long just 6,5 meters, he traveled for 4000 miles, from France to Brazil, without any aid from ashore neither using assistive technologies as in other races. In 2012, Sergio took part in the round-the-world Global Ocean Race, Class 40 double-handed, winning the second prize. Sergio, on board of Calaluna – the new Class 40 built by Bert Mauri, founded and refitted- took part in the most important Mediterranean competitions, such as the Roma-Giraglia and the Rolex Middle Sea Race (the circumnavigation of Sicily starting and finishing in Malta). In April 2014, he was one of the most famous Italian solo-sailing navigators at the starting line for “Roma per uno”, the first edition in solo-racing of this competition. 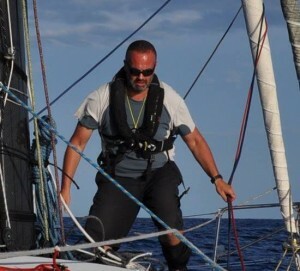 At the end of 2014, finally, the Italian skipper left for Pointe-a-Pitre, Guadeloupe, as a competitor in the race “Route di Rhum”: 4500 miles solo-sailing across the Atlantic, starting from Saint Malo, France.